Fiberglass swimming pools have become popular across Canada since they can be installed quite quickly and are easy to maintain. They may be a little more costly to install than concrete and vinyl liner options, but typically work out to be less expensive in the long run due to ease of maintenance and longevity. Factory-molded fiberglass pools can be found in just about any shape and size imaginable and are delivered to your home as a one-piece unit. This allows you to design your own pool to meet your backyard requirements. Most pools come with steps and seats built into them and you can add on other options to your design unique. These include items such as lighting, waterfalls and an added hot tub. You can also choose from different types of decking including fiberglass edging, an accented border, or a cantilever deck with poured-concrete which can be combined with a variety of finishes such as pebbled or tiled. Once you’ve designed your fiberglass pool it will be constructed by the manufacturer. Fiberglass is a lightweight, but strong and consistent material which is created when small glass threads are weaved into fabric which is then hardened by a unique polyester resin. Weather-resistant gel is then added to the surface to make it smooth. When the swimming pool has been constructed it will be delivered to your home and installed into the pre-excavated hole. The installation process can usually be completed between in a week or two. When the pool has been installed it will be time to install the deck and pool finish. You can often be swimming in your fiberglass pool within days and will be glad to find out there isn’t any type of major maintenance needed to keep the pool in good working order. The pH levels are more stable due to the smooth finish of the fiberglass and you’ll find there’s a minimum amount of algae because of fit. This will free up both time and money since you’ll need fewer chemicals and allotted time to add them. You’ll have more time to enjoy the pool rather than cleaning it. However, this doesn’t mean you can just fill the pool with water and leave it for the summer. You’ll still need to test the chemical levels on a regular basis and adjust them as needed. You’ll also need to make sure the pump, filter, and heater etc. are all working properly when opening the pool. Cleaning the floor and walls will definitely be relatively easy though as they can be kept spotless simply by wiping them with a damp rag or sponge. If you have a stubborn stain that you can’t get rid of with a regular pool cleaning product, it’s a good idea to call your pool dealer because harsh or strong cleaners could damage the pool’s special gel coating. It’s also recommended to consult a professional pool company if your fiberglass pool needs to be drained to make sure it’s done properly. Most fiberglass pool owners also save money on energy costs as the material retains the heat better than other types of pools and the heater isn’t required as often. And of course, there’s no liner needed so there’s nothing to rip, tear, or replace. If you’re thinking of installing a fiberglass pool let’s just go over the benefits again. 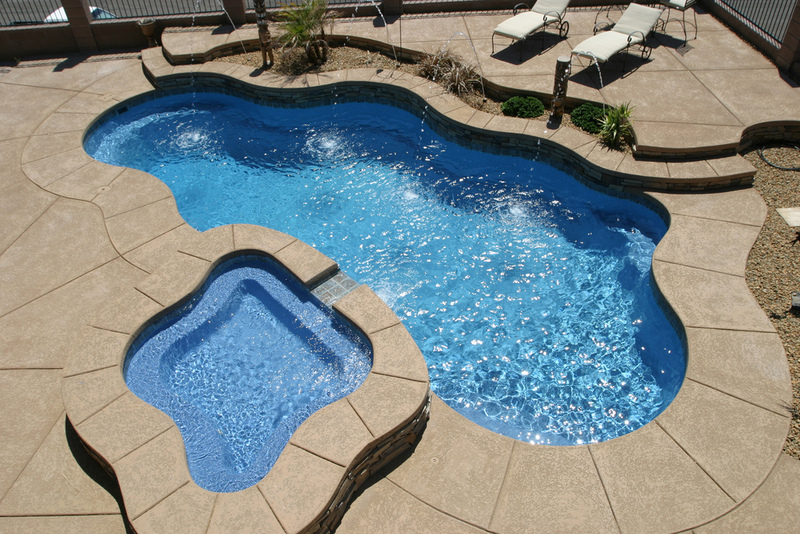 The pools are easy to install, maintain, and clean when compared to the alternate options. They’re also easier on your body because of the smooth, consistent finish, which also makes it harder for algae to grow. There’s no need to fork out the money to replace a liner every decade since the pools don’t require one. In addition, there’s no resurfacing or acid washing needed like there is with a concrete pool. Fiberglass pools work fine with a salt-water chlorine generator as the devices aren’t hard on the pool’s surface. For more information on fiberglass pools and our lifetime warranties, please feel free to contact us at Elite Pool Builders for a free estimate on your fiberglass pool project.